Technology is really amazing nowadays. Instead of the usual paper notes and memos, office computers are now equipped with network messaging systems that help the company go green and paperless. 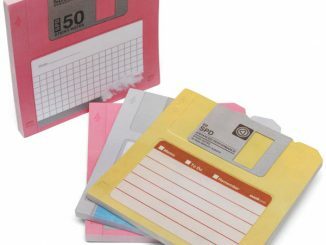 But if you want to go back the paper route and be all old school and keep up with the times at the same time, then you might want to go for these Cursory Notes or for the similarly-themed Pixelated Hand Sticky Note Pads. 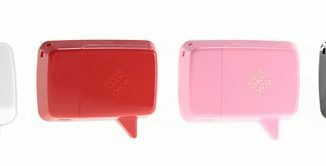 The Pixelated Hand Sticky Note Pads are tiny enough to fit into the palm of your own (real) hand. 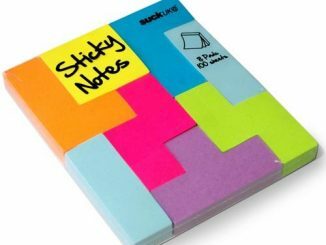 While the note pads in the Cursory Notes followed the actual cursors you see on your computer screen, these Pixelated Hand Sticky Note Pads don’t. 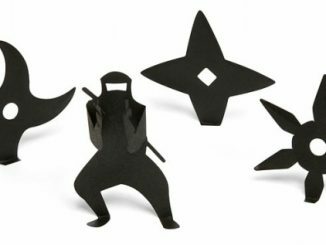 For these, you can get either the thumbs up pad, the grabbing (about to drag) hand, or both if you go for the set. Talk to the hand. 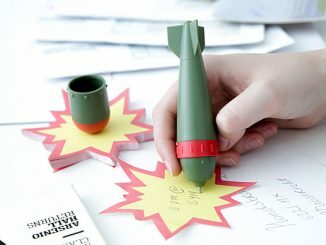 Ok, so don’t talk to the hand – write on it instead. And make the hand pixelated and in recognizable shapes. Like the hand that grabs things and the hand that shows your approval of something. 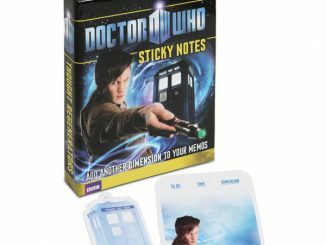 Oh, and make the hand a pad of sticky notes. 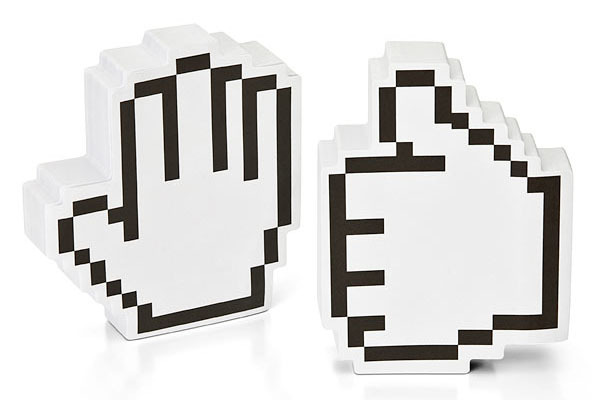 Suddenly, you have these Pixelated Hand Sticky Note Pads. 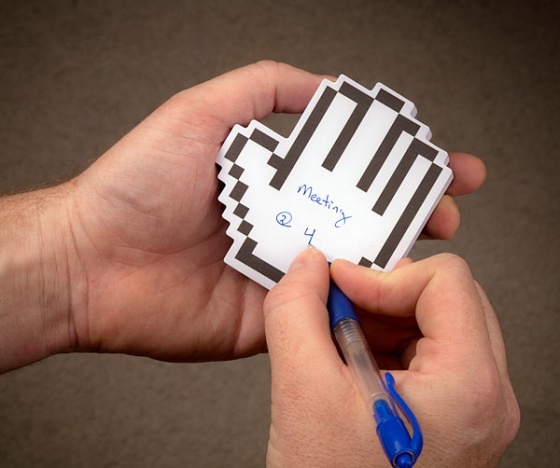 The Pixelated Hand Sticky Note Pads really are simple. There’s the Grabby hand, the Thumbs Up (or down, depending on how you look at it) Hand, and the Two Pack (which is one of each). 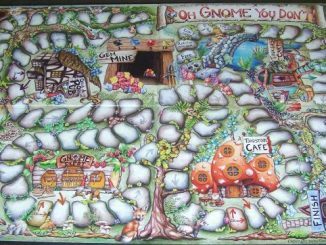 200 sheets per pad – all waiting to hold your memos, messages, doodles, etc., and stick them onto different surfaces. 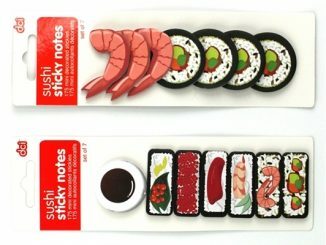 These Pixelated Hand Sticky Note Pads are available online from ThinkGeek. 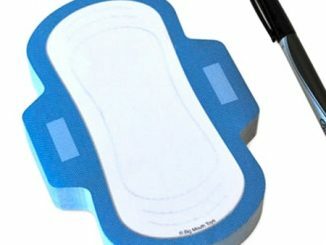 The Thumbs Up and Grab Hand pads go for $4.99, while a set of two goes for $8.99. 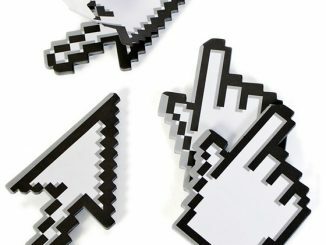 Turning ordinary stuff into their cursor-like and pixelated counterparts is becoming increasingly popular. First, there were the Pixel Oven Mitts and the Pixel Time Wall Clock. Then there was the USB Pixel Mouse. The newest one to join this group are Cursory Notes.